AICC general secretary Rahul Gandhi today heard out Congress workers of Punjab, as they cited their reasons for party�s debacle in the recent Assembly elections. 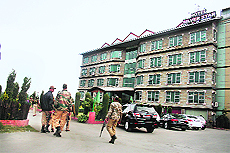 The Punjab Government has suspended two senior police officers. While Inspector-General of Police (IGP), Vigilance, SK Asthana, has been suspended with immediate effect for keeping unauthorised manpower, Superintendent of Police (SP) Dharm Singh Uppal has been suspended for intimidating witnesses. Expressing displeasure over the lack of will to protect women against sexual harassment at workplaces, the Supreme Court today directed the Centre, states, private and public sector companies to treat the reports of the complaints committees dealing with such offences as �inquiry reports� relating to disciplinary action and not as preliminary findings. 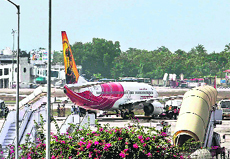 The woman pilot of an Abu Dhabi-Kochi Air India flight set off the hijack alarm in panic after agitated passengers allegedly stormed the cockpit here today. Six passengers were detained for questioning. Addressing the key issue of inadequate infrastructure along the Chinese frontier, Prime Minister Manmohan Singh today told the top brass of the Indian armed forces that the country has to keep upgrading its infrastructure.